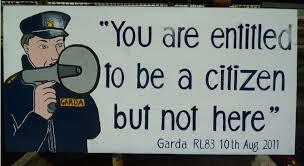 You are entitled to freedom of expression – but not near the Shell Refinery in Ballinaboy!! In 2007 the local community opposed to Shell’s Corrib Gas Project erected 9 crosses in memory of the Ogoni 9 and highlighting the struggle for a clean environment, proper management of natural resources and respect for our human rights that connects the two communities. The place was then blessed by a Nigerian clergyman and by th local Parish Priest. A number of signs were also carefully positioned there as to not interfere with road safety or the environment but highlighting the ongoing ecological and economical destruction, the injustices and the breaches of citizen’s rights that are happening here. But these signs must have interfered with the conscience of some people. In an act of vandalism and censorship the signs which have been in place for years, were taken last week, coinciding with the expected of visits from dignitaries and the media which are being organised by Shell’s PR team. The Environmental Protection Agency has granted Shell an Industrial Emissions licence to operate its gas refinery at Bellanaboy in north Co Mayo. The licence has been awarded subject to a number of conditions. The company had submitted a revised application to the EPA after the Commercial Court quashed a previous licence in October 2013. Shell has been granted an industrial emissions licence by the Environmental Protection Agency (EPA) for its gas refinery at Bellanaboy, Co Mayo. The licence is one of the last consents required by the Corrib gas developers. The licence allows for “operation of a gas refinery” and “combustion of fuels”. It was issued by the agency on Thursday October 8th and has been posted on the EPA’s website. Shell Ireland yesterday declared that on-site work is complete for gas to flow from the Corrib gas field. Shell E&P Ireland confirmed that from a technical point of view, production of gas can now start — 19 years after gas was discovered off the coast of Mayo. However, the Corrib gas partners cannot commence production until two separate permits are granted by the Environmental Protection Agency and the Department of Communications, Energy and Natural Resources. Mary Robinson, Global Climate Justice Hero? Or Not? Just a year ago, Amy Goodman interviewed Mary Robinson, former President of the Irish state and UN Commissioner for Human Rights & Climate Justice. At the time I thought she was wonderful. I’ve recently come to believe just the opposite. Mary Robinson has, at best, been indifferent to the environmental justice struggle closest to her home! She has never spoken out to support rural people seeking climate justice in the west of Ireland. 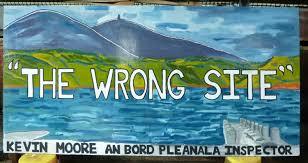 Her fellow countrymen have struggled against Shell Oil in County Mayo Ireland since 1999.